Brace yourself! She's giving up! 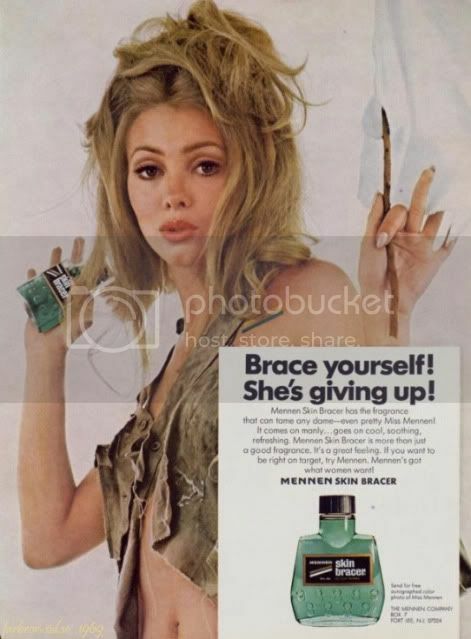 Mennen Skin Bracer has the fragrance that can tame any dame -- even pretty Miss Mennen! It comes on manly... goes on cool, soothing, refreshing. Mennen Skin Bracer is more than just a good fragrance. It's a great feeling. If you want to be right on Target, try Mennen. Mennen's got what women want! I have no idea what's going on in that ad. She's holding a . . . stick? And half of her hand is hidden in a . . . jungle handkerchief? I don't get it. Like, at ALL.